Unfortunately, due to sales rights restrictions, we cannot offer Men of War for sale in your country. In the grand tradition of John Keegan's enduring classic The Face of Battle comes a searing, unforgettable chronicle of war through the eyes of the American soldiers who fought in three of our most iconic battles: Bunker Hill, Gettysburg, and Iwo Jima. This is not a book about how great generals won their battles, nor is it a study in grand strategy. Men of War is instead a riveting, visceral, and astonishingly original look at ordinary soldiers under fire. 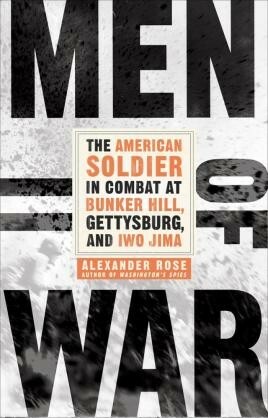 Drawing on an immense range of firsthand sources from the battlefield, Alexander Rose begins by re-creating the lost and alien world of eighteenth-century warfare at Bunker Hill, the bloodiest clash of the War of Independence—and reveals why the American militiamen were so lethally effective against the oncoming waves of British troops. Then, focusing on Gettysburg, Rose describes a typical Civil War infantry action, vividly explaining what Union and Confederate soldiers experienced before, during, and after combat. Finally, he shows how in 1945 the Marine Corps hurled itself with the greatest possible violence at the island of Iwo Jima, where nearly a third of all Marines killed in World War II would die. As Rose demonstrates, the most important factor in any battle is the human one: At Bunker Hill, Gettysburg, and Iwo Jima, the American soldier, as much as any general, proved decisive. To an unprecedented degree, Men of War brings home the reality of combat and, just as important, its aftermath in the form of the psychological and medical effects on veterans. As such, the book makes a critical contribution to military history by narrowing the colossal gulf between the popular understanding of wars and the experiences of the soldiers who fight them. Honor, fear, cowardice, leadership, anxiety, compulsion, elation, doubt, misinformation, cruelty, violence, self-sacrifice and compassion: this book covers everything in a brilliant analysis of the phenomenon of men in battle. Rose has written the best book on the subject since John Keegan's "The Face of Battle” four decades ago.